Don’t miss this bright, well maintained, spacious 2 bedroom, 2 bath + den CORNER condo in sought after Convoy Quay Gardens on the Bedford Waterfront. 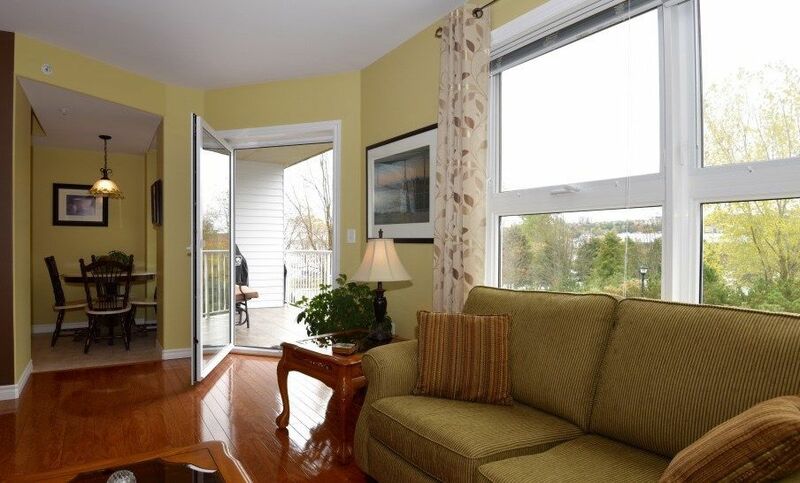 This attractive condo has views of the Bedford Basin, DeWolfe Park, and the beautiful courtyard gardens. Enjoy morning views from the breakfast nook and the excellent afternoon light through the large windows or from the tiled south facing balcony. This quiet seaside community offers a waterfront boardwalk, clubhouse with social and small fitness rooms, a workshop, a heated outdoor pool and gorgeous landscaped grounds and gardens with a water fountain. Extra bonuses include: gleaming hardwood floors, ensuite with jacuzzi, heated underground parking (#37), stacking washer & dryer, in unit storage room, plus an extra storage unit underground. Live in Superintendents, key less entry and heat & hot water are included in condo fees. Push the elevator button and you are on the Bedford Waterfront; watch sailboats racing by or simply take a stroll on the 3 km boardwalk or walk to restaurants, banks & coffee shops.